Have you ever sat through a Meerkat stream and thought “I could do better.” Now you can! 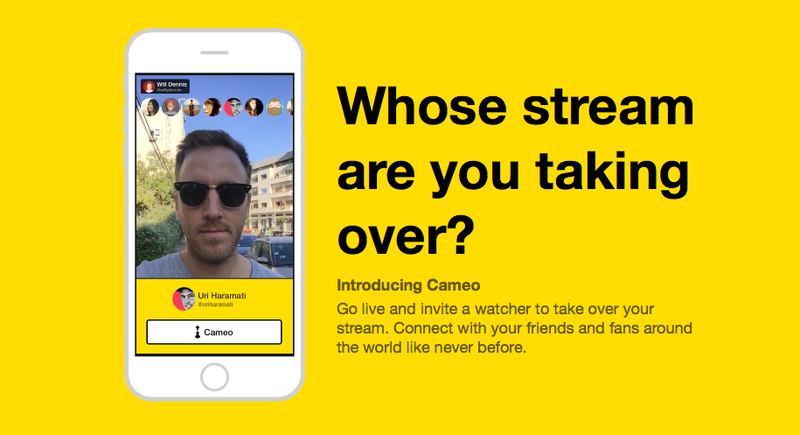 Cameo, a new feature in Meerkat, lets viewers take over a livestream. Of course, those viewers are only allowed to take over once the person responsible for the stream allows it. To allow someone to take over your stream, just tap their profile and choose the “Cameo” option. An invite, which lasts 60 seconds, will display on their screen. You can also comment “Cameo @(their username)”. Once the new user takes over, you can end the cameo at any time. The person who took over your stream can end their cameo appearance at any time, too. When their appearance is over, the stream returns to you. Cameo will undoubtedly find favor with groups at large events who want to provide different vantage points of the same event. Concerts and other live music events come to mind straight away. It’s also a killer feature for Meerkat; one Periscope doesn’t have, and won’t be able to duplicate without scrutiny from users. The feature doesn’t appear to be live on iOS or Android just yet, but considering it’s been officially announced, we expect it soon.